My family loves pancakes. We eat them at least once a week, sometimes more. We love them for breakfast, but we also enjoy pancakes as a fun breakfast for dinner. 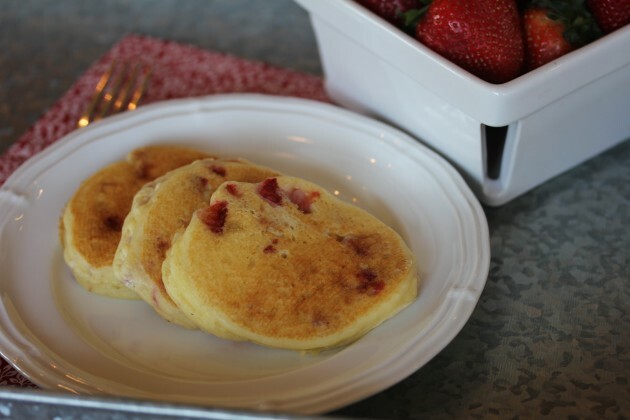 These gluten free strawberries and cream pancakes are the perfect for breakfast or dinner during the summer. 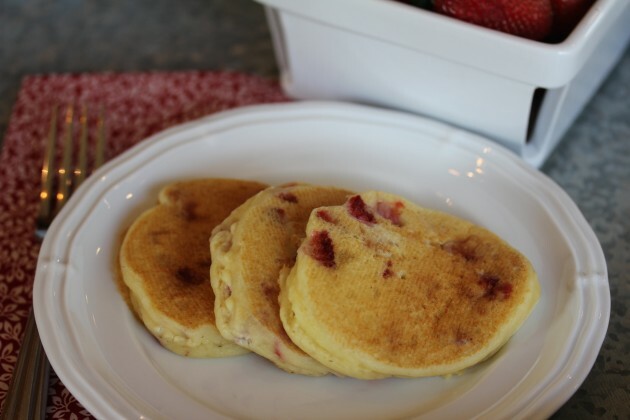 Fresh fruit in pancakes makes for a quick and easy meal. 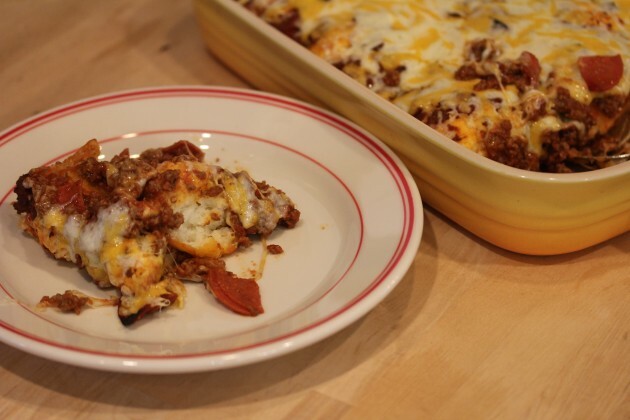 And since this uses my basic gluten free baking mix, it is also an easy gluten free meal. In a bowl combine baking mix, milk, sour cream, and eggs. Whisk together until combined. Pour 1/4 cupfuls onto hot griddle. Cook until bubbles start to form, which is about 2-3 minutes. Flip pancakes over and cook for another 2-3 minutes or until done. 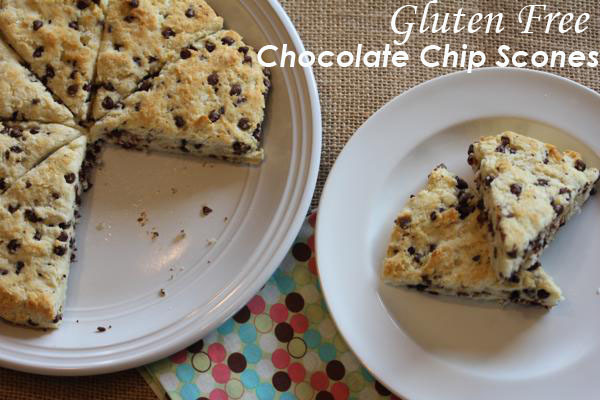 Gluten Free Chocolate Chip Scones are a simple gluten free treat that are perfect for breakfast. I love making a large batch of these to keep in the freezer for busy mornings. They also make a great lunch box treat or afternoon snack. I mean really who does not love a good chocolate chip scone?! In a bowl mix together biscuit mix, milk, and egg. Stir until combined. Press into a circle on a cookie sheet or baking pan. You may need a little rice flour on your hands to press it out. 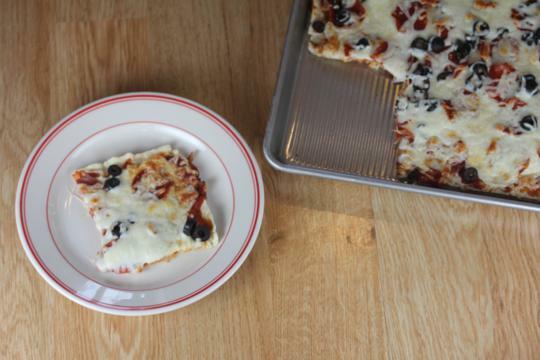 This recipe for bubble pizza was adapted from a recipe I made long before I was gluten free. Bubble pizza was a meal my kids used to love and it was one of the few meals that I would actually by canned biscuits for. When I finally figured out my gluten free baking mix, I knew I needed to figure out how to make it work with bubble pizza. It took some tweaking, but the end result was so worth it. My whole family loved this and I actually think it is better than the version I used to make. This recipe will be on our menu often. Really, anything with pizza in the name is sure to be kid friendly. Add in lots of meat and cheese and you know you have a winner. If your kids love pizza this is a must try. Brown beef in a skillet. Drain off any fat. Stir in pepperoni and pizza sauce. Set aside. In a bowl combine baking mix and buttermilk. Stir until a dough forms. Drop dough by large tablespoons into a 9×13. Spread meat/sauce mixture over top. 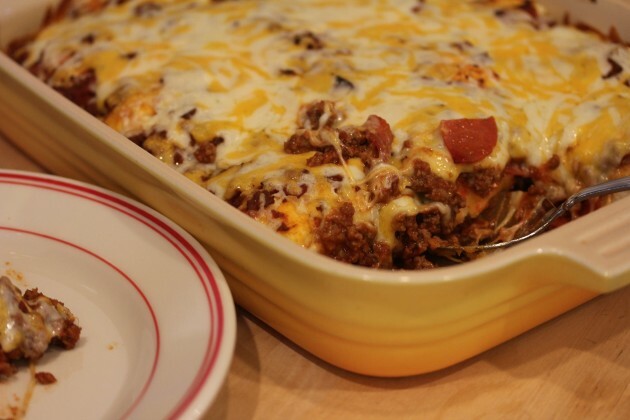 Sprinkle with cheese and bake for 5-8 minutes more or until cheese is melted. Gluten free pizza can and should taste great. It really can taste as good as the pizza you remember without taking a lot of work. This pizza crust is so simple to put together using the basic baking mix. In just a few minutes you can have a delicious gluten free homemade pizza to serve your family! Grease an 11×14 sized cookie sheet or pan and set aside. In a bowl combine biscuit mix, hot water, and buttermilk. Beat just until a soft dough forms. Using a little rice flour on your hands press dough onto cookie sheet. Remove from oven and place sauce and toppings on pizza. Bake for 6-8 minutes more or until done. 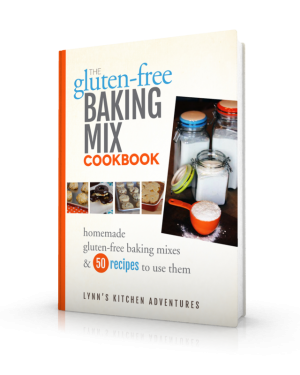 The Gluten Free Baking Mix ebook is based on a basic gluten free mix. I have four versions of the basic mix, all using a different fat. My ebook includes over 50 recipes that I have developed for using this mix and am continuing to develop more. So stay tuned for more quick and easy and delicious ways to use this basic mix. All versions of this mix work great in recipes, but I have noticed a slight difference in how the end results turn out. I have found that I like to keep several versions on hand. You might decide that you like to do the same or you may find a favorite version that you enjoy. My favorite version is the butter version. I think it is the most versatile in all the recipes. The downside to the butter version is that it needs stored in the refrigerator. The shortening version works great and I love it, but it is shortening, which is not my favorite fat to use. However, if you are out of butter or need a more shelf stable version, the shortening works great. The lard version is delicious, and I love it in savory type foods. Since it is lard though it has a little bit of a different taste, so I would avoid it in cookies and desserts. The coconut oil version is a great dairy free and slightly healthy fat option, however it does change the taste of recipes. The coconut oil version works really well in pancakes, muffins, and breakfast foods. In other things we could taste the difference, but if you are used to baking with coconut oil, you may not notice the difference as much as my family did. Combine all ingredients in a food processor and pulse a few times until mixture is blended together until chunks are small pea sized. Depending on the size of your food processor you may need to do this in batches. You can also mix this with a pastry blender or using two forks, just be sure it is blended well. Note: Store baking mix in an airtight container. If mix is made with butter or lard it should be store in an airtight container in the refrigerator. 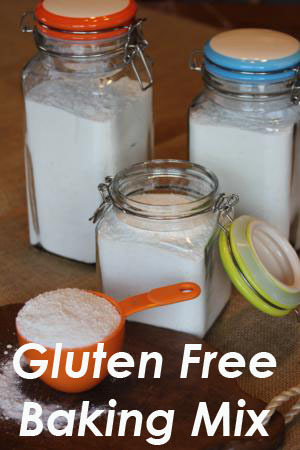 Welcome to my new site Gluten Free Mixes. 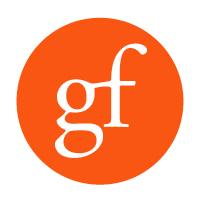 My goal with GF Mixes is to share gluten free recipes that are quick and easy and just happen to be gluten free. Gluten free eating does not have to be time consuming or expensive. It does not have to taste bad. Gluten free can be easy and delicious. My new ebook The Gluten Free Baking Cookbook shows you how easy gluten free can be by sharing a simple master baking/biscuit mix along with 50 recipes for using it. This site is designed around that concept. Plus, I keep tweaking, experimenting, and trying new things with this basic mix and I will share the new recipes I come with here. I also have all kinds of other mixes planned. A gluten free yellow cake mix anyone?! Yes, that will be coming soon along with all kinds of other homemade gluten free mixes. Be sure to subscribe and to follow along on my GF Mixes Facebook page.